Do dogs see colors? Does that affect our dog training in any way? 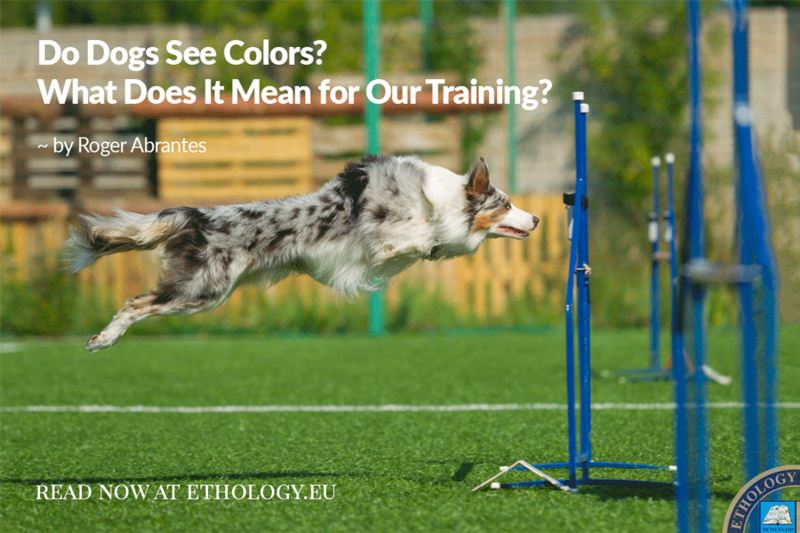 In the early 1980s, we performed some tests at the Ethology Institute Cambridge to determine whether dogs were colorblind as the popular view says. The conclusion of our experiments was that they could distinguish between some colors and could not discriminate certain other colors. They are not completely color blind (seeing only shades of gray). They were more like some people who see colors though not the full spectrum. However, we could not determine, at the time, whether the color discrimination of the dogs was due to differentiating between real colors or various shades of gray. Meanwhile, more modern research has cast some light on these questions. Eyes contain light catching cells (cones) that respond to color. Canines have fewer cones than humans, which implies that, in principle, their color vision cannot be as good as ours. To see colors, we need various types of cones, which can detect different wavelengths of light. We have three types of cones, which gives us the possibility to register what we call the whole range of color vision. Researchers at the University of California at Santa Barbara tested in the late 1980s the color vision of dogs. Their studies confirm that dogs see color, though not as well differentiated as humans do. For us, the rainbow looks violet, blue, blue-green, green, yellow, orange and red. For a dog, we presume it looks dark blue, light blue, gray, light yellow, darker yellow, and very dark gray. They seem to see violet as blue (like many humans). Studies performed by Russian scientists demonstrated that dogs tend to discriminate real color rather than brightness cues. Dogs have a dichromatic color vision, which means that they have two types of cones in their eyes. They match any color they register with no more than two pure spectral lights. Placental mammals are in general dichromatic. The ability to see long wavelengths necessary to distinguish red from green seems to have disappeared during evolution, probably after the Triassic period. Dichromatic vision is, though, good to distinguish colors in dim light, favoring the most nocturnal animals. Trichromats, like most humans, have three color-detecting cones (blue, green and red) and can distinguish between 100 different gradations of color. Honeybees are also trichromatic seeing ultraviolet, blue and green instead of blue, green and red. Human = A and C. Dog = B and D. It is difficult for the dog to discriminate between red and green. The term color blind is, therefore, somehow misleading. Some animals developed the ability to see some colors and others to see other colors all depending on what mutations appeared and the subsequent costs and benefits each strategy implied for their struggle for survival. 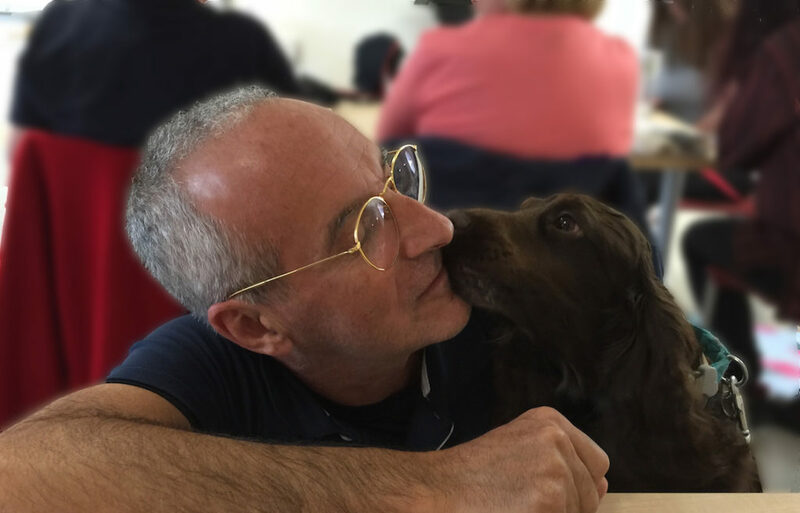 What does this mean for our communication and training of our dogs? Since dogs find it difficult to distinguish between certain reds and greens (like some humans do), we should choose toys and training aids in other colors. For example, light blue or yellow are much easier colors for a dog to detect. 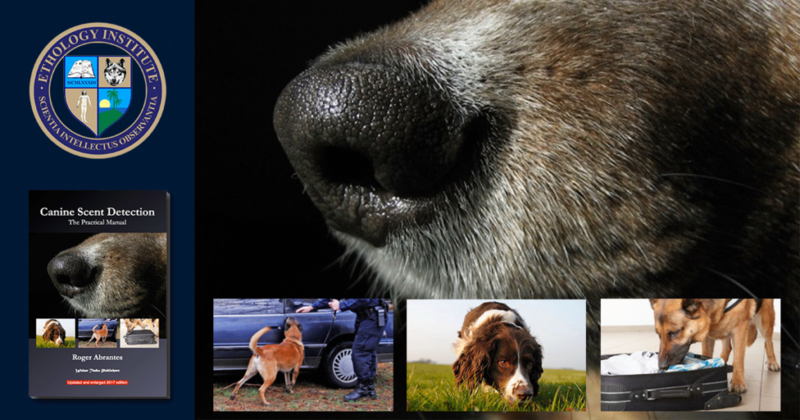 On the other side, when training them in any scent detection discipline, we should use colors for the targets that are difficult for them to see so to compel them to use their noses and not their eyes. Kasparson, A. et al. 2013. Colour cues proved to be more informative for dogs than brightness. Proceedings of the Royal Society. 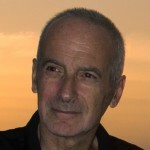 Neitz, J. et al. 1989. 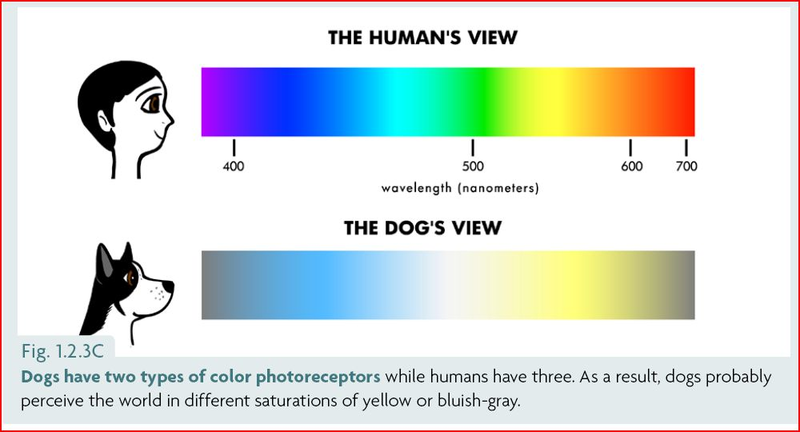 Color Vision in the Dog. In Visual Neuroscience, 3, 119-125. Cambridge University Press. Featured image: Since dogs find it difficult to distinguish between certain reds and greens (like some humans do), we should choose toys and training aids in other colors (photo by Oleghz).